Nicolas Roche will be a supported rider in the Vuelta rather than team leader, so hopefully chances will emerge for him on the road during the three week Tour starting on Saturday week. 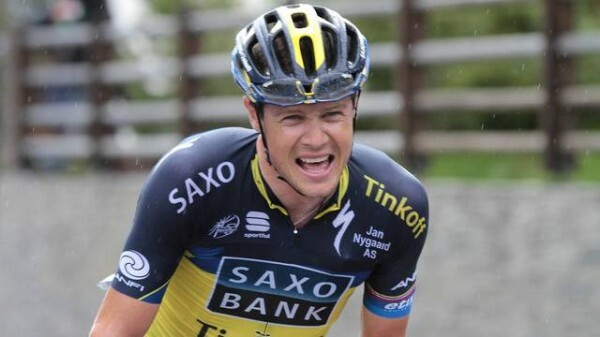 Hopes that Nicolas Roche would get his turn to lead Saxo-Tinkoff at the Vuelta a Espana starting the weekend after next have been dashed, with the team releasing a statement saying Roman Kreuziger will lead the squad. Roche is in his first season with the Bjarne Riis owned outfit, having spent much of his career at Ag2r, where he was almost always leader in any Grand Tour he rode. When he moved to Saxo-Tinkoff it was clear he would take on a support role at the Tour de France for Alberto Contador, and the Irishman did just that in July. However, Roche was hopeful he would get his turn to lead the team during some big races during the season, and it was always felt by observers that the biggest race he may get such an opportunity in was the Vuelta a Espana. However, in a statement revealing the make-up of its squad for the Vuelta, Saxo-Tinkoff has made it clear that in the absence of Contador from the race Kreuziger will be leader. The Czech rider has been in very good form this year, taking a win in the Amstel Gold classic, finishing 3rd overall in the Tour de Suisse and 5th overall in the Tour de France. Roche’s results are few and far between, but he has been going much better of late than in the early part of the season, riding very strongly in the Tour de France and finishing 5th in the Clásica San Sebastián the week after the Tour ended. As well as Roche and Kreuziger on the Vuelta team, Saxo-Tinkoff has also selected Chris Anker Sørensen (Denmark), Nicki Sørensen (Denmark), Michael Mørkøv (Denmark), Matteo Tosatto (Italy), Rafal Majka (Poland), Evgeny Petrov (Russia) and Oliver Zaugg (Switzerland). Saxo Tinkoff sport director, Tristan Hoffman said the team was entering the race with a very strong and versatile group of riders, which should give them “quite some cards to play” throughout the three weeks of racing. “We are also focusing on finishing the race with one of our riders well inside the top-ten, and if things play into our hands maybe even having two of our riders up there. With this group of riders I definitely believe it is possible, even though we know the competition will be fierce,” Hoffman said. “Going into the Vuelta I see Roman as the natural leader of the team. He has had a fantastic season so far and still feels motivated and ready, but Rafal, Nicolas and Chris will also have the support of the team, and then we will see how the race develops and adjust accordingly. I expect a great race, and I’m sure we will make a significant impact on the Vuelta,” Hoffman concluded. This year’s Vuelta a Espana kicks off with a team time trial from Vilanova de Arousa to Sanxenxo on Saturday week, August 24th.